In most other UK regions, the pay of the very top ranges from 10 times that of the very bottom to 8 times. Wealth inequality – In general, people in regions in the south of the UK (South West, South East and London) have more wealth than those in the East and the North. There is a gap of roughly 3 years between the region with the highest male life expectancy, the South East, and the region with the lowest, the North West. 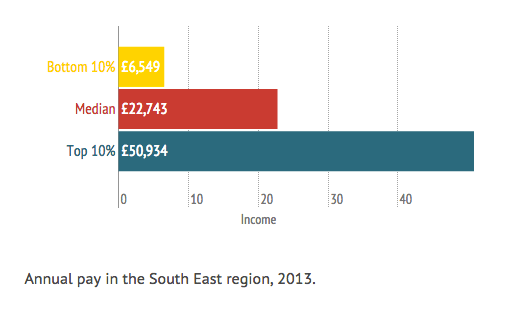 Of those in the richest 10% of UK earners, 16% live in the South East, the highest proportion outside of London. Of the poorest 10% of UK earners, 11% live in the South East, the second highest proportion in the UK and 3% higher then London. At £15.84 per hour London has the highest median wage of all UK regions. The South East has the second highest median wage; however it is possible that this is mainly due to its proximity to London, as many of those who live in the South East may work in London. Disposable income is an important measure when considering incomes and wealth within and across regions, as it helps to build a more complete picture of living standards. Average household income after Housing costs is higher then the National average. The link between income and health is well known, the richest people in England can expect to live 9 years longer than the poorest. Although inequality of average life expectancy across the UK does not directly mirror either wealth or income inequality, it does bear considerable similarities to wealth. Interestingly, there appears to be a statistically significant correlation between wealth and male and female life expectancy between regions, although no significant correlation between regional life expectancy and income. This means that although both men and women live longer in wealthier regions, they do not live longer in regions with the highest average income. Average life expectancy at birth for men in the South East is 80.3 which is the highest in the country.